Q: What are the discriminators in explaining the success or failure in the market? A: Margins have been declining but they are stabilising. As a result, it is important to keep costs low and focus on niche markets. SingTel, for example, has been focusing on reducing the cost of termination to India while maintaining voice quality. Credit management is also crucial as a few bad debt situations will completely wipe out the margins earned over the year. Q: Could you differentiate between the requirements of the regional market from those of others – say Europe or the US? A: We notice that the regional market here in Asia remains robust but there are disruptions such as the Philippines rate increase, which take your focus away from the business. Q: What effect is local regulation/deregulation having on the market? A: The effect is significant. In the case of the Philippines market, the local regulator was quite active in handling complaints from carriers who objected to the rate increases. Without their intervention, US carriers would not have been able to come to a compromise with their Philippines counterparts. On the other hand, deregulation helps bring down the cost of termination and a good example of this is India. Q: What are the technological step changes you are anticipating in the future? A: We see a general migration of TDM traffic as a mainstream transmission technology to the latest voice-over-internet protocol (VoIP) platform. By the end of 2002, international VoIP had grown to an estimated 18.5 billion minutes annually, which should represent more than 10 per cent of all international traffic. With increasing deregulation in VoIP across Asia, this poses several opportunities for SingTel to further consolidate our position as the market leader for VoIP related services. One of SingTel International Carrier Services (ICS)’s priorities is keeping abreast of new technologies and anticipating the needs of customers. We must adapt to rapid technological changes, for instance the burgeoning of Wi-Fi/Internet/VoIP advances that would potentially alter the ways of transporting a call to its destination. The business unit is constantly rethinking of ways to harness and capitalise on these dynamic challenges. Q: What are SingTel’s goals in the wholesale carrier business – what is its strategy to achieve this – what have been the recent steps the company has taken to realise these goals? Retaining a competitive edge and focus on employee development and innovation. A recent initiative is the integration of the ICS units of SingTel and Optus. This allows both companies to have a clearer focus and to share knowledge and expertise. The expanded network coverage also enables SingTel to extend its presence as we continue to see significant growth in interconnections traffic. As a result of the integration, international carriers now work with one main contact representing both SingTel and Optus. This provides a strong base to negotiate volumes and manage network utilisation effectively across Singapore and Australia. The integration of ICS has provided access to new partners for both SingTel and Optus. Optus can now leverage the traditional partnerships that SingTel has with other incumbents and SingTel can likewise leverage the challenger partnerships that Optus has with second tier challenger carriers in other countries. For example SingTel is connected to Bangladesh Telecom, Bharti (India) and Verizon (USA). Optus can utilise these relationships for increased sales, reduced costs and improved quality to these countries. Similarly, Optus is connected to Clear (NZ), IDT (USA calling card operator), COLT and many Pacific Island destinations. Q: One of your goals is to be an infocomm hub in the Asia-Pacific. Could you outline what you mean for this and what are the factors/variables in achieving this? What international alliances are you making etc? 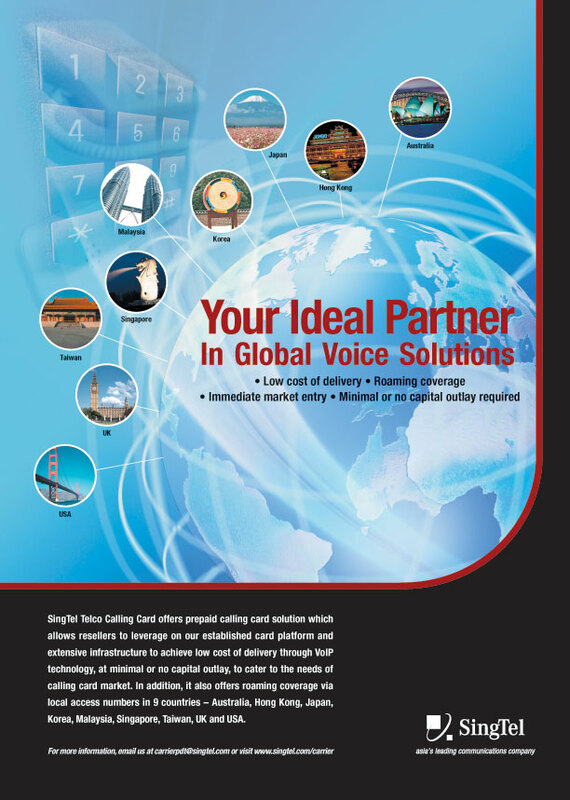 A: SingTel ICS is a major supplier of wholesale voice services worldwide. We have established bilateral relationships with over 200 telecom operators around the globe, and multiple direct routes to more than 85 countries. At SingTel, we leverage on our expertise and experience as one of the early players in the wholesale transit business in Asia. We often strive to be among the pioneering carriers in adopting next generation technology to ensure that we can deliver high voice quality, cost effective wholesale solutions to our customers and partners in Asia and worldwide. It is with this spirit that we are among the first in Asia to implement state-of-the-art softswitch routing technology to achieve routing efficiency and enhanced voice quality. Q: You have talked about your worldwide presence, could outline what this is and discuss how it aids your business? A: Besides the two hubs in Singapore and Australia, SingTel has offices in 24 countries around the world. In Singapore, SingTel has had more than 120 years of operating experience and has played an integral part in the development of the city as a major communications hub in the region. In Australia, Optus serves more than six million customers. It has driven the competition as the challenger brand and led the way in technological innovations and breakthroughs. The Group’s other major investments in the region include Advanced Info Service of Thailand, the Bharti Telecom Group of India, Globe Telecom of the Philippines and Telkomsel of Indonesia. Together with its regional partners, SingTel is Asia’s largest multi-market mobile operator, serving more than 40 million mobile customers in six markets. The steep growth in mobile penetration around the world has added immensely to total global voice traffic volume. With mobile traffic growth expected to rise consistently over the next few years, SingTel ICS has positioned itself strategically as one of the more competent wholesale provider of mobile traffic delivery over its network in terms of competitive termination rates and high voice quality. SingTel ICS also endeavours to support SingTel’s regional mobile alliance partners in their bid to strengthen their foothold in the mobile 3G environment by providing the partners GPRS Roaming Exchange (GRX) services to help them grow GPRS and 3G services in their respective domestic markets. Q: In terms of carrier services Singtel lists: Traditional Switch Transfer Services, C7 Roaming Signaling, Transit Services, Telco Calling card solutions and GPRS Roaming Exchange (GRX). Could you outline first how you are refreshing these services with improved services, what additional services you planning to add and what trends for demand for each type of service has the company identified? A: SingTel ICS is constantly developing a wide range of targeted services to meet the needs of national and international telecom operators and mobile operators. Our portfolio consist of C7 Roaming Signaling, Transit Services, GPRS Roaming Exchange (GRX) and VoicePlus voice transit including value added services such as IP-based Telco Calling Cards and IP Audio Conferencing service. These services enable international carriers and wholesale resellers to enjoy reliable and seamless global connectivity. SingTel has recently partnered TSI Telecommunication Services Inc. (TSI), a global communications technology company based in the USA, to provide a new international wholesale service, ANSI/ITU Signalling Conversion Service. SingTel is the first carrier in Asia to offer TSI’s conversion service to mobile operators. This service works by converting mobile roaming signalling messages based on the ANSI (American National Standards Institute) standards used primarily in North America to those based on the ITU (International Telecommunications Union) standards used in other regions, and vice-versa. The conversion is needed to enable mobile operators in North America (operating GSM850/1900 networks), and in other parts of the world (operating GSM900/1800 networks) to offer their customers international roaming on each other’s networks.